Do Not Allow Bodyaches, Slip Disc & Knee Pain to Affect your Sleep & Lifestyle! Put your muscle rubs & painkillers away and start doing Pilates! Pilates strengthens your postural muscles, reduces muscle imbalances, and improves the alignment & posture of your body. Most of our clients are surprised by how a few sessions of Pilates classes can help them to tone their body, increase flexibility and coordination, and most importantly, reduce their body aches. These benefits extend well into your lifestyle habits – function at your best in both work and leisure activities when the aches and pains are no longer affecting your mind & body! Pilates For Body Aches is suitable for people who have spine health issues (such as slip disc, sciatica etc), body aches and joint pains (such as knee pain or tennis elbows) or are recovering from injuries. It is perfect for folks who want to get a permanent solution to their body woes through improving their fitness without worsening their condition. Flexi-Stretch Pilates Class focuses on lengthening tight muscles due to prolonged inactivity or regular sporting activities. This class is especially useful for those with sedentary occupations, muscle stiffness, chronic pains or scoliosis. Flexi-StretchPilates Class works hand in hand with Body Aches Pilates class to reduce body aches and improve flexibility. 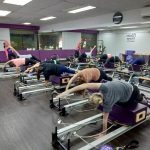 A minimum attendance of 5 Reformer Group (Weight Loss or Body Aches) Classes is required before you can attend the Flexi-Stretch Pilates Class.